Drop-stitch material holds 10+ psi of air pressure for superior rigidity. 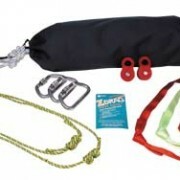 Two sets of heavy-duty 2″ webbing handles provide handholds for two people. Two 1.5″ stainless-steel D-rings on the nose allow for towing, lining and lowering. Top deck is covered with a textured and grooved foam pad for a grippy, non-slip ride. A top-quality Leafield C7 inflation valve provides trouble-free performance, and a Leafield A6 pressure-relief valve protects the board from over-inflation. Rolls up compactly for easy transport and storage. 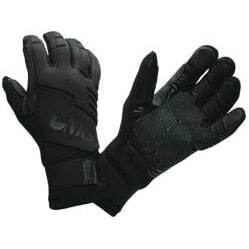 Features include: – 3.5 mm neoprene with titaniumlaminate adhesive, making them our warmest gloves. -The palm and fingers are constructed of rubberized, armored, synthetic leather that gives excellent grip and durability — essential for rope handling and other demanding physical work. -Fingers are pre-curved to relieve hand fatigue while gripping paddles and ropes. -Seams are glued and blind-stitched for durability and warmth. -PowerSpan 4-way stretch fabric provides increased finger mobility. -GripCote on the backs of the fingers helps prevent wind chill and evaporative cooling. 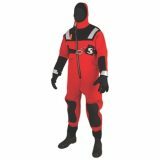 -A soft strip of fleece on the inner side of your hand and forearm is perfect for wiping the sweat from your brow after a successful rescue. -Wristband with hook and loop closure ensures a secure fit. Designed for water rescue and SAR swimming, the Shredder SAR fins have the short fin shape for explosive thrust and exceptional maneuverability. With a large foot pocket and the adjustable heel strap, the Shredder can be worn over water boots such as the ice rescue or drysuit boots. 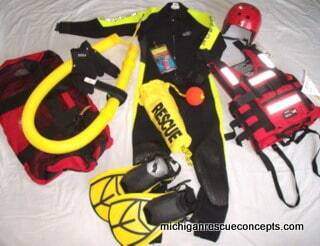 Order XL to fit over ice rescue boots. Heavy-duty rugged traction sole keeps you on your feet in varied terrain, and the comfortable 7mm neoprene insole absorbs the shock of every step. 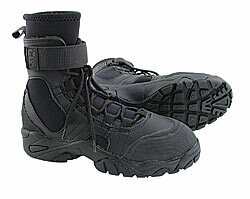 Lace-up synthetic leather and 5mm neoprene upper provide warmth, unmatched ankle support, and a secure fit. Swiftwater rescue can be extremely cold and demanding work. That’s why we made the NRS Rescue Glove extremely warm and tough. When lives are on the line, you’ll want these gloves on your hands. NRS Rescue Gloves feature 3.5 mm neoprene with titaniumlaminate adhesive, making them our warmest gloves. The palm and fingers are constructed of rubberized, armored, synthetic leather that gives excellent grip and durability — essential for rope handling and other demanding physical work. Fingers are pre-curved to relieve hand fatigue while gripping paddles and ropes. Seams are glued and blind-stitched for durability and warmth. PowerSpan 4-way stretch fabric provides increased finger mobility. GripCote on the backs of the fingers helps prevent wind chill and evaporative cooling. A soft strip of fleece on the inner side of your hand and forearm is perfect for wiping the sweat from your brow after a successfulrescue. Wristband with hook and loop closure ensures a secure fit. 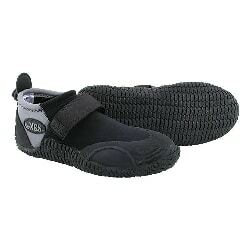 The NRS ATB Wetshoe combines the rock-solid Workboot sole with the simplicity and warmth of a zippered neoprene upper. 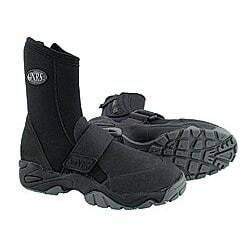 All-terrain traction, protection and support. The hiking boot lug sole gives superior traction, in the water and on land. You’ll like the comfort and warmth of the 5-mm neoprene upper while the 7-mm insole cushions your foot for quick side hikes or a grueling portage. It’s a great shoe for daily river running. YKK® ankle zippers make it easy to get in and out of. A wide, secure instep strap adds that extra bit of security. Whole sizes only. Women order one size smaller. 1/2 sizes order one size larger.